I am predisposed to see any opera by Gaetano Donizetti (1797 – 1848). After all, the first opera I ever enjoyed was Lucia di Lammermoor and recently (see below) I was captured by the inventiveness and wit of the comic opera, Don Pasquale, after seeing a simulcast of the production at the Metropolitan Opera. This weekend we saw another simulcast, Anna Bolena, with Marco Armiliato conducting, in a premiere production by David McVicar. This was one of the two or three best operas delivered by the Met to an Australian cinema. Maybe Anna Netrebko will have to demand comparison, in portrayal of this role, with Joan Sutherland or Maria Callas. To my untutored taste, her singing elevates her to that stratosphere. As you would expect with a Met production, the other performances are uniformly good: Ekaterina Gubanova as Jane Seymour and Ildar Abdrazakov as Henry VIII. The opera was written and first performed in 1830 and made Donizetti’s reputation. Just think of his total output of 70 operas! No wonder that in the 1950s, Richard Bonynge thought that in unearthing bel canto – operas by Donizetti, Bellini and Rossini – he had entered an Aladdin’s cave of vocal treasure. What I didn’t expect was a dramatic impact to beg comparison with my favourite opera, Verdi’s Don Carlo 1867 (see below). There is the same sense, as with Don Carlo, of a group of adults in a royal court, trapped in a personal and dynastic drama, the sense of doom one finds in a Greek tragedy. When the curtain rises revealing the royal court at Greenwich in 1536, the standing of Queen Anne, Henry’s second wife, is sinking fast. Anne admits as much to her confidante and lady-in-waiting, Jane Seymour. This is heavily ironic given that Jane Seymour is the woman now attracting the attentions of Henry VIII. The portrayal of Jane is a measure of the opera’s subtlety. She is guilt-ridden over the betrayal of her queen. She loves her queen – and her king. There is nothing she can do about it. Fate is carrying her toward personal crisis. For Anne Boleyn, fate is even more tragic. Her former lover, Lord Richard Percy, arrives on stage, brought back from exile by his king. For his part, Percy is still in love with Anne. Like a Tudor Stalin, Henry VIII is playing with people’s lives with a diabolical cruelty. 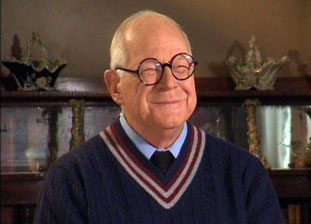 He has brought Percy back to his kingdom to trap Anne. He orders one of his officers to spy on the couple. The tragedy in the opera will gather pace until Anne is imprisoned, becomes mad – yes, the opera features a mad scene to rival that in Lucia di Lammermoor – and departs the stage for her execution. I am musically illiterate and will need to hear this opera in a good recording a few times before my untutored taste is educated to its nuances. But the music, on first blush, is absolutely lavish. Being introduced to a new opera, especially one that occupies an important place in the great body of 19th century music drama, is having your consciousness stretched. I presume that this version will be talked about for a very long time. This was simulcast working at the very highest level. 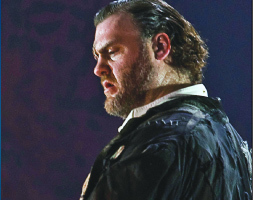 Don Giovanni is next, booming from cinema screens November 19 and November 20. Some operas work because they present us with a flow of beautiful music. The settings can be comic, fairy tale or fantasy. It doesn’t matter. The music carries us. 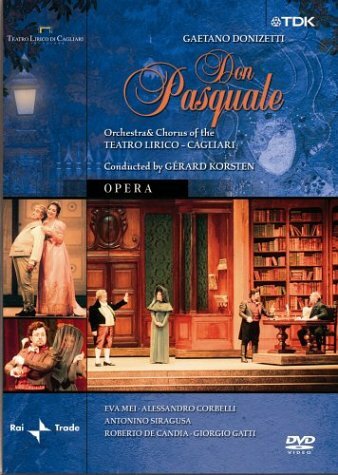 I’m thinking of Donizetti’s Don Pasquale, a current favourite. But sometimes the beautiful music is matched by a tragedy that drives believable characters. Don Carlo works better at this than any opera I can think of. One of its strengths is the combination of personal and political drama. It starts with the love that springs up between Elisabeth, daughter of the French king and Don Carlo, son of the Spanish king. They are expecting to be married as a symbol of the peace treaty between Spain and France. When they meet in the Fontainebleau forest, it is love at first sight, but disaster strikes with news that the peace treaty, being concluded at that moment, requires Elisabeth to marry not Don Carlo but King Philip, his father. In Act II the political theme is unveiled. Carlo is visiting the tomb of his grandfather, the legendary Emperor Charles V who ruled the Spanish empire and the Hapsburg possessions in Europe. Carlo’s friend Rodrigo, an aristocrat at the court, meets him having returned from Spain where, he tells Carlo, the Flemish people are suffering. Here we are being admitted to the inner circles of the court and introduced to the flame of treasonable dissent. Don Carlo and Rodrigo are in despair at the policy of King Philip and his imperial war to put down revolt in the Flemish lands and keep it and its people in the Spanish empire. This political dissent merges, of course, with Carlo’s desire for Elisabeth, married for political reasons to his old father. We see the king’s agony – we hear it in his music, as we hear the emotions of all these characters. The old king is weighed down by an almighty obligation to maintain the war against heretics which is the special burden of the Spanish crown. Meanwhile the king is beginning to have suspicions about his wife and his son. Rodrigo has just sung the stirring duet with Carlo that expresses their commitment to one another. He is now caught in conflict between the king who trusts him and the king’s son who is a bonded comrade. Essentially the opera is about the conflict that links six suffering people, lcoked in crises. The king is trapped in a life with a young wife who doesn’t love him; meanwhile he is being pressured by the old and blind Grand Inquisitor – a superb role – to further tighten the oppression of all who dissent from the orthodoxy of Catholic Spain. In Act IV the Grand Inquisitor demands that the king deliver a death sentence on Carlo and hand over Rodrigo because of his criticisms of the Flemish policy. Princess Eboli, the companion to the queen, is deludedly in love with Carlo. She hears Carlo loves Elisabeth. The revelation makes her betray Elisabeth to the king. Rodrigo is conflicted by the demand of the king for his loyalty and his bonded friendship with Carlo. And so to the climax. To me, simply, they are some of the greatest scenes in opera. Perhaps the very greatest comes in Act III when in a great public burning of heretics a group of Flemish deputies enter. They sing beautifully, asking for freedom, begging the king’s compassion for the Flemish people. I know of no chorus as moving as this in the whole operatic repertoire. It elevates itself into the plea of people, down the ages, for an end to tyranny from an imperial power. Carlo, Rodrigo and Elisabeth join this music, a compelling petition for mercy from the king. The king is burdened by the obligations of the crown, by a belief that he can only be merciful by being cruel, by a belief that overrides his self-doubts. He rejects these pleas. Carlo springs to life, drawing a sword on his father. He is disarmed by Rodrigo and arrested. High drama, both political and personal, with the music elevating and deepening the conflict. I’ve seen three productions of this opera: one in the Teatro La Fenice in Venice in 1992 and one in Vienna five years ago where the silly director had to lower onto the stage a photo of suffering Vietnamese to underline the chorus of the Flemish deputies, as if the audience were all numbskulls and couldn’t generalise this plea for clemency. This Met production, produced by Nicholas Hytner who made his reputation at the British National Theatre, conducted by Yannick Nezet-Seguin, is the best I’ve seen on stage or DVD. The only qualification I register is that one’s attention is never riveted in a simulcast the way it is in a live production. But I’m damn grateful for the technology that admits me to one of the greatest opera houses in the world to hear singers – and this is the distinction of the Met – of a uniformly high quality in an opera that must be ranked as Verdi’s greatest. Congratulations to the Opera Australia on this one. Overcome your deeply entrenched suspicion of contemporary opera. This is the one that will shift your prejudice. Of Mice and Men composed between 1965 and 1969 by Carlisle Floyd. I was unfamiliar with it, but it’s widely performed in America. It is John Steinbeck’s story about two ranch hands. George Milton and Lennie Small, in rural California. A teacher told me recently that teaching Steinbeck’s novel in schools today captures the attention of youngsters. In particular they like the character of Lennie the big, bumbling developmentally disabled figure who is psychologically dependant on his friend George. George protects him even when he despairs of him. In building a sense of the sinister, it has a faint echo to me of Benjamin Britten’s Peter Grimes – Lennie has a propensity to kill his pets. Anything with fur he will stroke to death. In perhaps the most realistic murder in opera, his stroking of the hair of the wife of the rancher transmutes itself into an act of violence. He breaks her neck and leaves her body covered with a sack in the barn. The first thing that struck me was how masterfully it was written for the voice. Floyd knew of many devices to give the illusion of a very large orchestration while leaving the right amount of space for the voice so that every sung word was intelligible. That was the most important thing. At no point did anyone have trouble hearing each spoken word. It was clearly written in the wake of Bernstein’s West Side Story, and you could hear not just Bernstein – but specifically West Side Story. Not so much that it’s overwhelming, but enough to make it clear that Floyd liked it and wanted to make musical reference to it. The dénouement was beautifully paradoxical. In the lead-up to the fatal gun shot, the music was seductive, alluring and lush. The two characters are talking about their ideal life on a farm that they buy together – they paint a vivid picture of it in their dialogue. The music is completely in support of this picture. 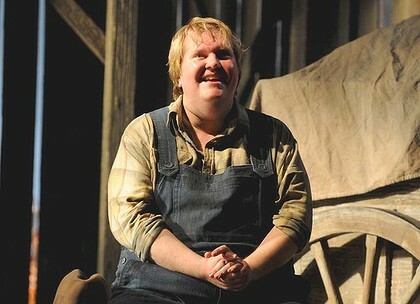 The paradoxical element comes in when the audience realises that George is preparing to shoot Lennie. It perfectly captures how you can use music in an opera psychologically. At the first of the three live performances we have seen, in Seattle in 1991, I was struck by the humor – never glimpsed when listening to the CDs or the occasional concert performances. In fact at this San Francisco Ring, directed by Francesca Zambello, the comedy was played pretty broad in the portrayal of the home life of the gods in the first two of the four operas, Rhinegold and Valkyrie, which means in the relationship of Wotan and his nagging wife, Fricka. The comedy was inserted with less sure-handedness in Götterdämmerung which showed us Hagen and Gutrune lounging on a double bed channel-surfing with a remote. The style took American touches : the Rhinemaidens like frontier beauties and Alberich as a gold prospector from the Californian Gold Rush ; Hunding’s forest cottage a Western cabin ; Mime raising Siegfried in a trailertrash setting under high voltage wires and next to a garbage tip. No, this didn’t get in the way of the message, apart from anything else because the acting was so sound. And – unmentionable – the singers, unlike those in the last San Francisco Ring we saw in 1999, our second Ring, were not defiantly obese. Yes, sorry to say it, but beautiful-voiced sopranos can’t persuade me they are Brunnhilde or Siegmunde if rolling with fat, and the same with the male roles. It wouldn’t work with Shakespeare and no director would attempt it and it sure as hell doesn’t work with opera. We were saved that here and the drama was enhanced even when, as with Mark Delavan’s Wotan or Ian Storey’s Siegfried, the voices were under-powered. The drama worked in every act. The Ring is about power. It is about choices and compromises and the consequence of the decisions that get made, under pressure, to resolve a conflict. It is all conflict – every act involves an argument about who gets what and what should happen next. In every act the characters are in argument, shifting alliances, making deals and breaking them. There is nothing in music like the power with which Wagner, after a 12 year gap, resumed his writing with the prelude to act three in Siegfried. This music captures the tumult in the mind of his main creation, Wotan, who is at this point resolving, as clan leader of the gods, to relinquish his power. And the elemental force powers us into Götterdämmerung with orchestral writing unlike anything you can hear from any other composer. This is opera as music drama, music harnessed to character and narrative, making a plain old symphony or concerto as dull as cold beef. In future only the pared-down simplicity of a sonata may do. And liking Wagner – not without reservations, I must concede – only makes me want to explore his great operatic precursors and rivals more : the two great Mozarts, Verdi’s Don Carlo and Otello, the finest of bel canto. But only when the art form reaches the very best international standards. Life’s too short for anything less. And the best is available these days on DVDs with high definition in sound and vision. The great age of music drama may be still to come, certainly if the technological tricks of the Met production seen recently on simulcast is a guide. If you don’t know Wagner make a start with The Flying Dutchman or The Meistersingers (with the Verdis and Mozarts above, this is one of the five greatest operas of all time) but quickly graduate to Das Rhinegold, see one of the simulcasts, read heaps and accept -and don’t resist – the conventions of this nineteenth century composer. On familiarity, it is as modern as it comes. For the many Australians in this audience, wedded to the Wagner mystique, there is the full New York Ring next year and a Melbourne Ring and a Seattle one in 2013. And, folks, these productions have one clinching advantage over performances on the continent, even at Wagner’s own theatre in Bayreuth : surtitles in English. For drama to work we need to know what’s happening, as it happens. Then a whole new universe opens up, and drags you in. The 2002 production, directed by Patrizia Carmine with Teatro Bologna. Former leader of the British Labor party Michael Foot loved bel canto opera, that is: the opera produced by Donizetti, Bellini and Rossini in the early 19th Century that emphasised beautiful singing, a brilliant display of vocal technique. Michael Foot loved it for its own sake, and because it was the entertainment his heroes Byron and Shelley would have listened to in an era when opera was popular entertainment and a universal art from. Gaetano Donizetti (1797-1848) wrote an incredible 75 operas. His Lucia di Lammermoor was the first opera I ever enjoyed. He wrote Don Pasquale in 1843. It is a comic opera and I’ve encountered it three times lately and am enjoying it tremendously. I’ve been listening to it on the CD of Riccardo Muti’s 1984 production. Late last year I saw a performance from the Metropolitan Opera of New York at a simulcast at the Chauvel Cinema in Paddington, Sydney. Recently I watched a DVD of a 2002 production (directed by Patrizia Carmine with Teatro Bologna). This is a discovery, a delight. But if you are as musically ignorant as I you will need to listen to it two, three or four times to appreciate it for its wit and subtlety and even the musical architecture. Take the duet of Malatesta and Norina in scene four. There’s a sense here that Donizetti is so enjoying himself that he doesn’t know when to stop. The music flows and flows. Donizetti, incidentally, uses a small double wind orchestra, as small as Mozart’s. You might note he invents a plangent trumpet solo – apparently an unusual technique, with trumpets up until his time being used only for bombastic or declamatory or triumphant music. This solo evoked the famous theme from The Godfather. Who knows? May even have inspired it. I use the term musical architecture. By this I mean the sequence of, say, aria then trio then ensemble and then finale. Deep in my musical ignorance – and it is profound – I found myself thinking that this same template was used by Donizetti in dramatic operas such as Lucia. It is a formula. But Donizetti’s beautiful touch with harmonies renders it something well beyond the formulaic, in this opera at least. The overture is immediately recognisable as from the genre of comic opera overtures, a potpourri of the melodies the audience will soon hear. But clearly from the higher end of the genre. When the action on stage begins we enter the realm of repetitive, almost motorised energy, but with the effortless flexibility that seems to be Donizetti’s style. The primacy of vocal tricks defines bel canto and is well and truly in evidence here. Especially with the role of Norina which is sung by Eva Mei with a big, rich voice boasting the flexibility that seems thematic of the music in this opera. Alessandro Corbelli, a veteran, probably past it, is the Don Pasquale. 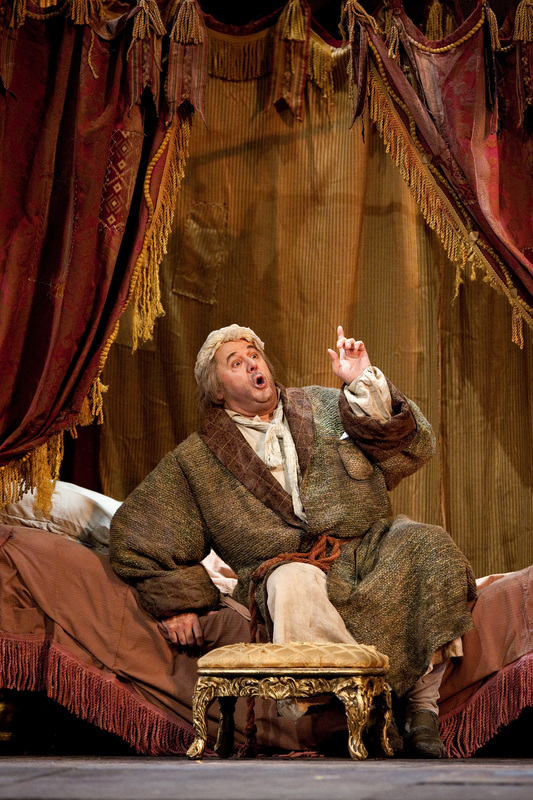 Antonio Siragusa sings Ernesto, as a large lyric tenor without any hint of baritone. Roberto di Candia is Doctor Malatesta and his voice is wonderful. The story is woven around stock commedia dell’arte characters, in this case, a rich old man who is manipulated into marrying a beautiful, cunning young woman who is really in love with the rich old man’s nephew Ernesto. Doctor Malatesta is the arch-conspirator who pulls the trick together, but – wouldn’t you know it – they all end up happy. Opera in Vienna: Christmas, 2010. The Vienna Staatsoper’s new production of Mozart’s Don Giovanni (1787) was the best of the three. It’s nocturnal and fast paced, as if the demons were driving the anti-hero to self destruction within the frame of 24 hours and he wasn’t going to lose a minute . Projected backdrops gave it a vaguely Spanish setting, largely under the vaulted ceiling of a wine cellar of an inn where Don Giovanni and Donna Elvira are coincidentally lodging. Why she enters dressed as a man was not self evident nor why she changed into womens’ clothing after her hymn of vengeance and Leporello’s humiliating catalogue. What I got from the production was clarity: clarity about Donna Elvira’s mood shifts, the complexity in the Ottavio-Donna Anna relationship and the Masetto-Zerlina rupture and the manic drive of the protagonist to keep seducing women on every front despite society closing in on him. The director was Jean-Louis Martinoty and the conductor Patrick Lange. Don Giovanni was sung by Ildebrando D’Arcangelo. I’m not a connoisseur of the voice. It’s the totality of opera as music drama that summons me to the opera house and the place of a particular opera in European cultural history. 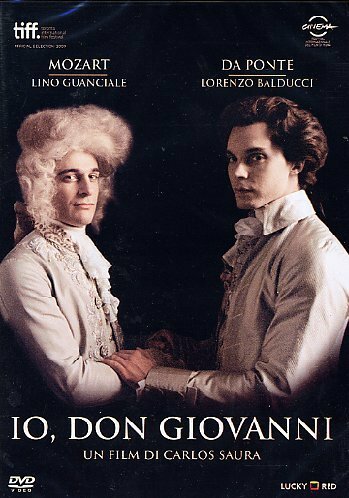 You might want to see the recent movie I, Don Giovanni, an historical drama about Mozart’s librettist da Ponte. As young as Mozart and as ambitious, da Ponte was a Jew, Mason and Catholic priest and a friend of Casanova whose exploits made him the inspiration for the Don Giovanni story. The movie captures some of the commercial opportunism with which he and Mozart threw the thing together, for example creating two big soprano roles because of the need to satisfy two demanding female stars. 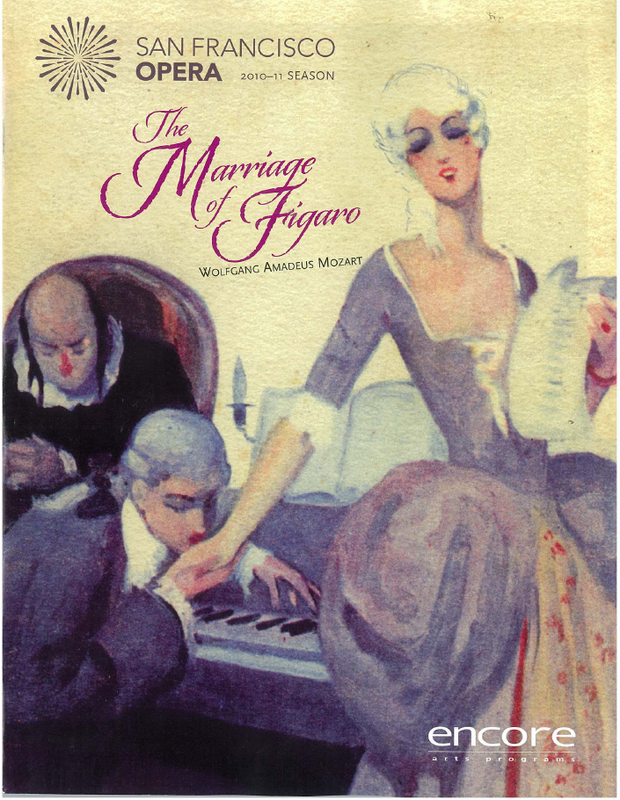 They thus came to write one of the five greatest works of opera history and a piece of theatre that flavors European thought from the time of the French Revolution, as does its sister, The Marriage of Figaro written a year earlier. The same could not be advanced for Verdi’s The Masked Ball (1859). 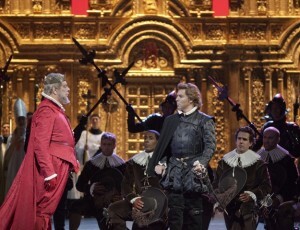 I’ve seen it three times and watched a video version with Domingo but the jaunty dum-de- dum tunes combined with chocolate box sets and powdered wigs – set, as it is, in the royal court of Sweden in the 1790s – place it in a different universe from the full, mature Verdi works of Don Carlo and Otello. But seeing this production, a little tired though it looks, and helped by the quality of the singing which even I could appreciate, I understood it as a tale of fate. “Fate is just and assigns his death to me,” sings Renato, friend to King Gustav and his strongest supporter in a court full of conspirators. Renato becomes alienated from the king when he catches the monarch dallying with his wife, Amelia. From that moment he joins the king’s enemies while the king is unable to free himself from his passion for his courtier’s wife and she, for her part, has gone too far in being driven by her passion for the king. There are elements of Don Carlo or Aida in this – a story of mature people being force-marched to destruction by ill-fated love within the closed world of a royal court. And there are arias – Amalia’s last, for example – which I want to hear again as soon as possible. That, at least, is my uncultivated view. 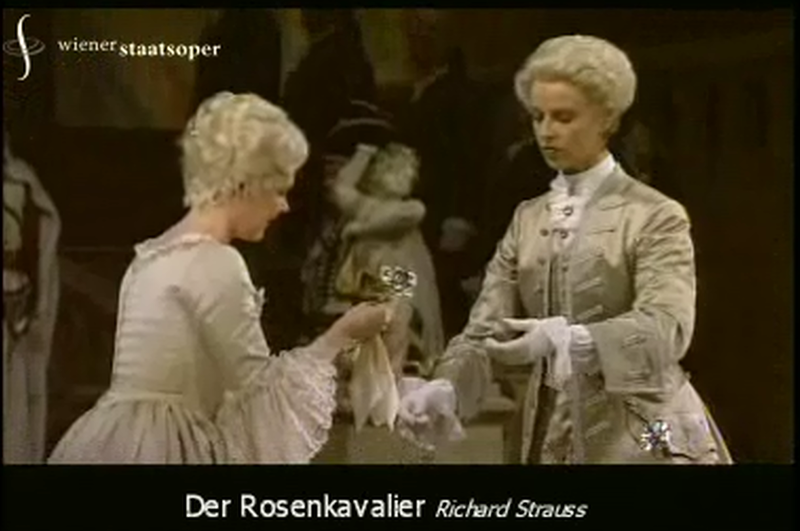 The third opera in Vienna this December 2010 was Richard Strauss’ Der Rosenkavalier. It was first performed 100 years go and is perfumed with Viennese or Habsburg culture, some of it ersatz like the tradition of the silver rose being presented to a fiancé . From the post-coital languor of the overture leading to the bedroom scene with the Marschallin and her teenage lover Octavian,right through to the final acceptance by the mature woman that she has to help him to his new young love, the music holds, shapes and informs the psychologies of the main characters including the comic Baron Ochs, Falstaffian cousin to Marie Therese. Director was Otto Schenk, the conductor Asher Fisch, and lead singers Adrianne Pieczonka (The Marschallin) and Stephanie Houtzeel (Octavian). An important lesson here: an opera that at first approach seems formidable, its music a strange challenge, on every new hearing becomes more digestible and friendlier, even light and ironic in tone. Like the experience with The Ring Cycle as described below. Faced with a choice between Vienna and anywhere else on the continent for an opera- focused holiday go with the Austrians – because you get English sub-titles! I think you know the difference this makes. It does to me – crucial unless the performance is exceptional or very familiar. Last week Helena and I saw three operas in three days performed in their traditional, somewhat pompous, but acoustically cheerful War Memorial Opera House. The pick by far was The Marriage of Figaro directed by John Copley, with a great cast including Danielle de Niese, born in Melbourne of Scots and Sri Lankan parents and trained in L.A. She sang Susanna. What she and the rest of the cast demonstrated – for me at least – was that spirited acting can transform this 1786 opera into a music drama superior to just about anything that the last two centuries of music theatre has produced. After t hree decades of opera going it took this production to persuade me of the seminal importance of Figaro, not just in opera but in our culture. And personal traffic o n the stage (such as Cherubino hiding behind chairs in Act I and Act II) or the complex appearances and disappearances in Act IV (in the garden of the villa) were handled naturalistically. Slash your wrists when you reflect on Mozart dead at 35. 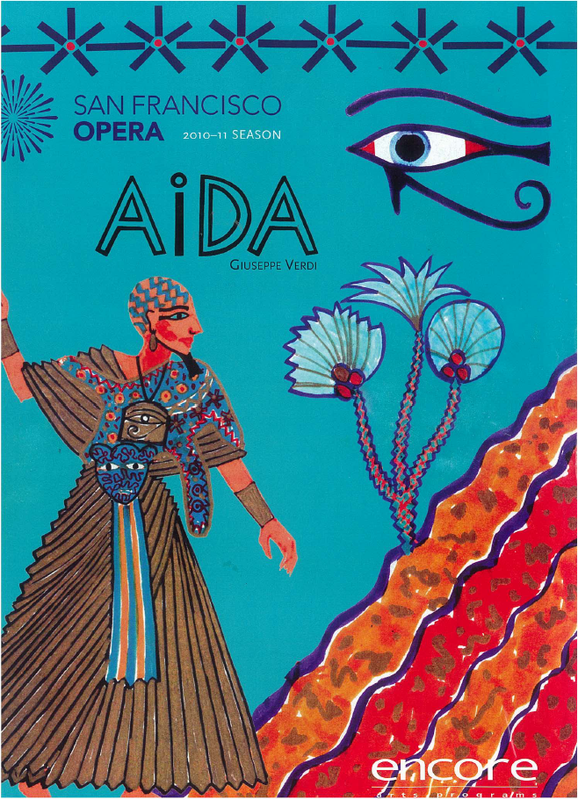 Here too was a production of Verdi’s Aida (1871) that confirmed the thing doesn’t have to overwhelmingly grand. There are many intimate encounters in the opera, especially the interactions on the banks of the Nile outside the temple of Isis that open Scene I, Act III. 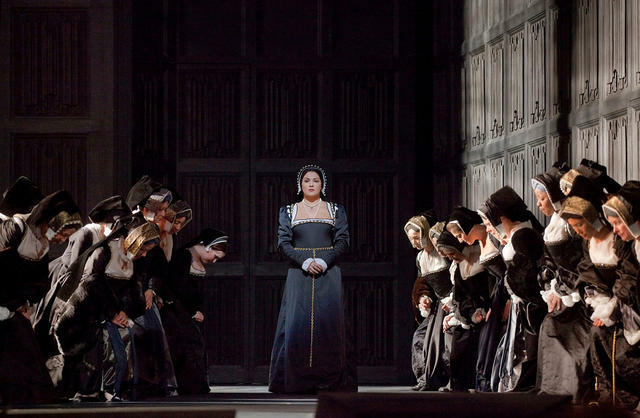 I was struck by the echoes of Don Carlo (the plea for mercy for the Ethiopian prisoners echoing the plea for mercy for the Flemish prisoners in the earlier opera) although to me Don Carlo (1867) is undoubtedly the greater work. 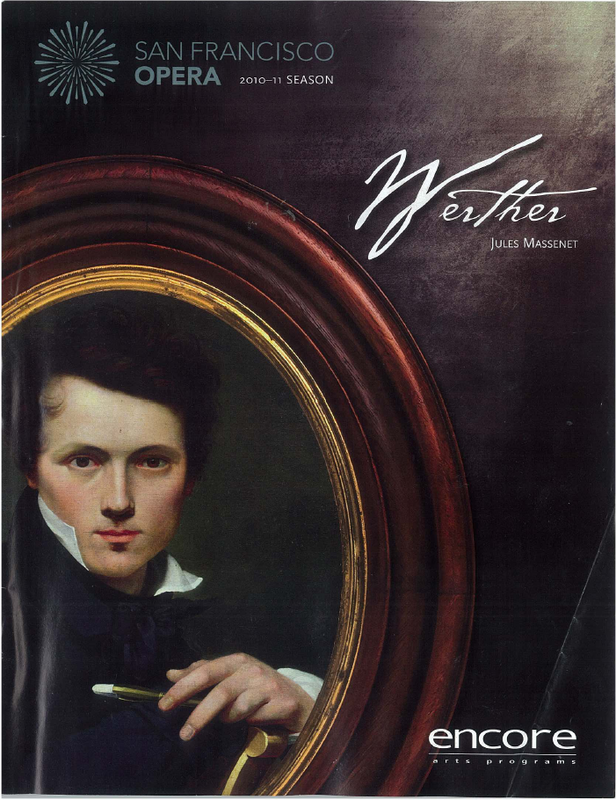 Jules Massenet’s Werther (1892) was a revelation as well, a psychological drama at least in this production by David Gockley. 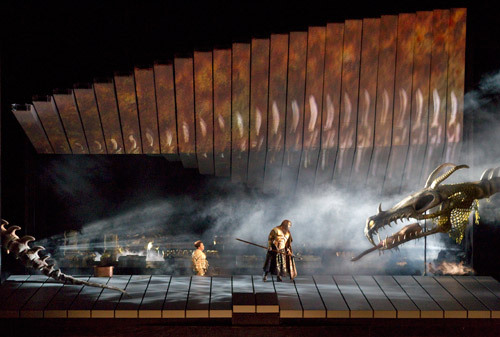 San Francisco has planned a Ring Cycle for June next year. Hard to say no based on what they’ve achieved this year. I know that Copley production. It’s old, done just before this AO production which was a rinse of it, but it’s true to text and still works very well. You had a great cast. Danielle de Niesse is a peach, born in Melbourne of Scots and Sri Lankan parents, tranied in LA … made her UK reputation at Glyndebourne, and Luca Pisaroni and Lucas Meachem are rising star baritones, both very easy on the eye. Lucky you! I can also recommend another Figaro, the DVD from the Royal Opera Covent Garden, again with a superb cast, perfectly matched and wonderfully directed by David McVicar. I think it’s as perfect a realisation as one could hope for on disc. My pity for the poor souls who haven’t allowed The Ring Cycle to settle in their bones. Yet there were days where I only had to hear someone say “Wagnerian opera” to respond by a sneer. Waiting a good decade I discovered Wagner only in my 30s. The only qualifier I add is that you must see it with English subtitles and must prepare yourself with study. 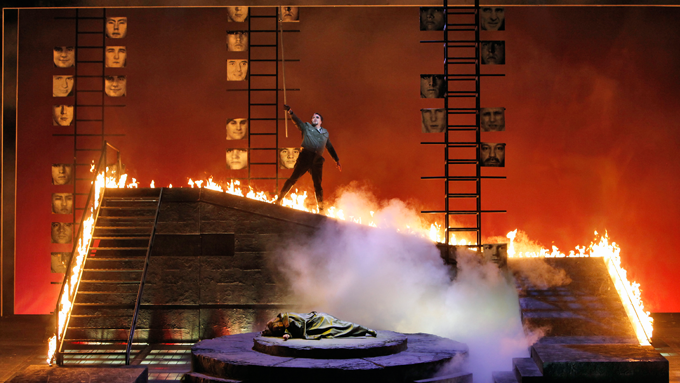 But watching the New York Metropolitan Opera’s simulcast of Rheingold in the Chauvel Cinema on Sunday, the first of the four Ring operas, I was struck how, with familiarity, this epic becomes somehow compact, light – think of the music of Loge, god of fire –and ever ironic. A young girl, watching with her mother in New York, told a friend of ours The Ring was her comic strip. It is not ponderous or pompous or “heavy” at all. It’s power, greed, family, the struggle and compromises of life. Wotan, king of the gods, admits to terrible forebodings as his clan of deities take possession of Valhalla in the last glorious scene. Die Walkure, the second in The Ring, is broadcast from the Bayreuth Festival February 11, 12, 13 and 16 at Palace Theatres in Australia. Now this is a gift – performances from the world’s greatest operas coming to our cinema screens. Verdi’s Don Carlo ranks with The Ring (see comments in opera section) and comes from The Met to our cinemas January 8 and 9. One final educative comment. At this standard opera can claim to be, as Wagner argued, the all inclusive, most elevated of art forms. Don’t believe me? Haven’t seen them? Your loss, kiddo. Trust Carr on this one. Figaro is the perfect ‘entry level’ work for a a young person, before the Justin Beiber mania claims them. Can’t decide what Chrissie present to select for that sensitive, yet promising niece or nephew? What better than a risotto at Guillaume at Bennelong followed by a seat at Mozart’s masterpiece. (February, I think).